After over 2 feet of snow was dumped on most of New England in the beginning of February, the submission of those “damn” ice dam claims may start at any moment. Record high temperatures may have melted the snow in a blink of an eye, but the potential damage caused by those ice dams over that time period is still fresh in everyone’s memory. The damage arising from ice dams is a constant and recurring threat from winter CAT storms. 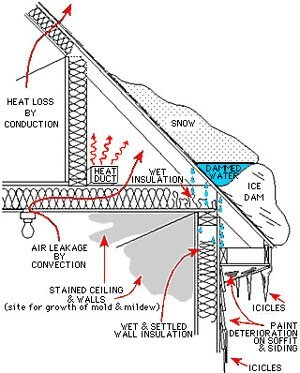 Many times a threshold question for both insureds and insurance companies is quite simply: what is an ice dam? An ice dam is a ridge of ice that forms at the edge of a roof and prevents melting snow (water) from draining off the roof. The water that backs up behind the dam can leak into a home and cause damage to walls, ceilings, insulation, and other areas. Numerous coverage issues can arise from ice dam claims. Although ice dams themselves or the removal of the ice damage are not generally covered losses under insurance policies, the water damage arising from the ice damage itself may be covered and may be the bulk of the damage being sought. Other claims arise from roofs that may have collapsed from the weight of the ice dam. Like many winter claims, the insured first must prove that it sustained a direct loss or physical damage during the policy period. During Winter CAT storms, damage from ice dams as well as other related damage happens over much longer periods of time. Insurers should determine whether the damage was in fact related to the ice dams in question. Insurers should also determine whether the insured took steps to mitigate its damage including hiring someone to clear snow or ice. In some policy provisions, this duty is explicitly set forth in the policy. If such mitigation costs are being claimed, are these costs recoverable by insureds under “Sue and Labor” provisions? Even if the policy does not contain a “Sue and Labor” clause, there is a duty under the policy to take all reasonable steps to prevent further “property damage,” with reasonable costs incurred to prevent additional damage covered under the policy. Typically, policies do not specifically provide coverage for ice damage removal costs. However, many insurers may cover part or all of these removal costs as an act of good faith and as part of mitigation efforts.